• Abu Qatada is known as Osama bin Laden's "spiritual ambassador in Europe"
LONDON, England (CNN) -- Britain's Foreign Office has been holding talks in London with the attorney of a jailed Jordanian associate of Osama bin Laden in a bid to secure the release of kidnapped BBC reporter Alan Johnston, officials said Thursday. Johnston, who turned 45 on Thursday, was taken captive at gunpoint in Gaza on March 12. Foreign Office officials said radical cleric Abu Qatada -- known as bin Laden's "spiritual ambassador in Europe" -- had offered to make an appeal to Johnston's captors to let him go, according to the Foreign Office's media relations group. Qatada is a radical Muslim cleric from Jordan . However, the officials dismissed reports that Qatada, who has been held under British anti-terrorism laws since late 2005 in the Full Sutton High Security Prison north of London, would be allowed to travel to Gaza. They stressed the Foreign Office did not make deals with extremists. On May 8, Johnston's purported kidnappers posted a new video calling on the British government to free Qatada in exchange for the journalist. The video showed a picture of Johnston's BBC identification card, and its audio track asked Britain to free "our hostages, especially Abu Qatada, the Palestinian ... free our hostages or else we will treat yours similarly with no exceptions." The 20-minute video was made by a group calling itself Jasish-e-al-Islam, or The Army of Islam. It was posted on a Web site used by Muslim extremists and, according to a BBC report, was also delivered to Al-Jazeera television network in Gaza. Last month, a previously unknown militant group calling itself the Tawad and Jihad Brigades faxed a statement to news agencies saying Johnston had been killed. Palestinian President Mahmoud Abbas, however, said Palestinian intelligence indicated he was still alive. British ministers have described Qatada as an "inspiration" for terrorists such as Mohammed Atta, the lead hijacker behind the 9/11 attacks. Qatada -- also known by his real name, Omar Mahmoud Mohammed Othman, and as Omar Abu Omar -- has denied the accusations. He has been convicted in Jordan in connection with two 1998 bombings. In December 2005, Qatada urged the Islamist militants who kidnapped four Christian aid workers in Iraq to free them. The message was beamed to Middle East satellite stations. Three of the hostages were rescued, but one, American Tom Fox, was killed. Many other individuals and groups were involved in fighting for their freedom. Johnston joined the BBC World Service in 1991 and has spent eight of the past 16 years as a correspondent, including periods in Uzbekistan and Afghanistan, the BBC said. Since 2004, 15 journalists, including Johnston, have been abducted by gunmen in Gaza, the Committee to Protect Journalists says. All the others were released unharmed, usually within days of their kidnapping. 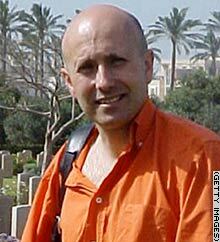 Johnston has been held in captivity longer than any other journalist abducted in Gaza.